Oasis Trade is a non regulated / unlicensed Forex & Crypto Currency online broker that opened in November 2018. They are owned by; Oasis Tech Ltd, with an address of: Suite 305, Griffith Corporate Centre, Beachmont Kingstown, Saint Vincent and the Grenadines. Their – Reg. Number: 24865 IBC 2018. Main phone number in Luxembourg is: +352 2787 1595, and the email address for compliance is: [email protected]. 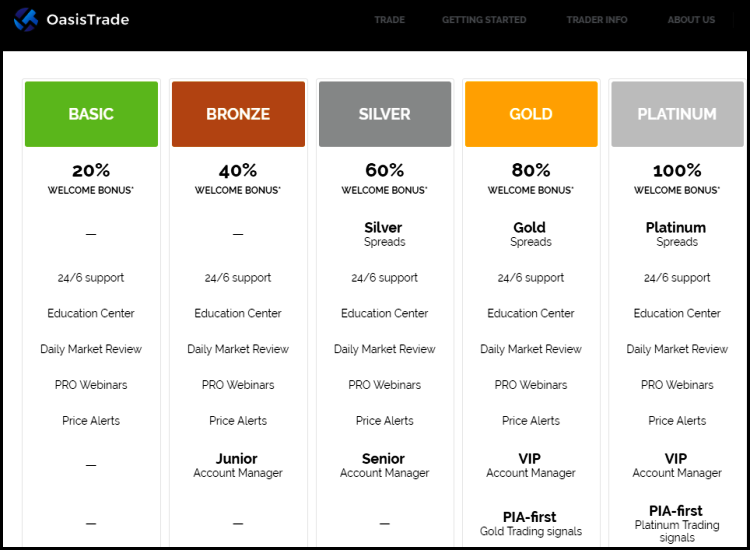 Official brokers website is: https://www.oasistrade.com/. While reviewing the brokers Oasis Trade, we see that they offering the full range of assets in Forex, Markets, Crypto and Metals. Oasis Trade offers their investors the simple and easy to use Panda trading platform, but it is only available as a web-based trading platform. If you are looking for an MT5 or a broker with mobile trading apps, find a broker here. The popular Crypto Currency’s are all available at this broker, including Bitcoin, BCH, Ripple and Ethereum. IOTA, NEM, TRON and EOS are among the smaller Crypto coins they offer to trade. It is important to understand the difference between trading crypto and investing in crypto. When you are using a CFD (Contracts for Difference) broker, you will be trading and looking to profit based on the movement in price. You do not actually own the currency. OasisTrade offers five account types, with the main difference being their welcome bonus. The minimum deposit for a Basic account is $250, and the minimum withdrawal amount is $100. Crypto Currency trading just like Forex trading is considered an investment service, which must be regulated by your local governments regulator. The difference between a licensed broker and an unlicensed broker is who will insure your money when the broker goes out of business. OasisTrade is not a regulated broker! Forex brokers in the United Kingdom are licensed by the FCA, and brokers in Australia are regulated by ASIC. Did you know that you can choose from more than one hundred Crypto brokers today? Have a look at these popular licensed Forex brokers. 24option is the popular broker for most new investors, because of their user friendly platform. They are licensed and regulated in Europe, South Africa and Belize. Start with your Demo Trading Account, signup here.